The nice thing about getting farm fresh produce through a service is you don’t have to choose what to purchase. We pick up a large bag of produce once a week at a local park, and there’s always something I wouldn’t normally buy (but will gladly eat). Some people don’t like CSA programs for that reason, but I think it’s a good way to get variation in our diet. This week we got cauliflower. I don’t even remember the last time I ate cauliflower, much less bought it. I have nothing against it, but I don’t have a burning passion for it either. Of course I could use it in a stir-fry (and I will), but I decided to make a soup too. The result was better than I expected. Sonny even asked for seconds, which made me feel warm and fuzzy inside (or was it the 85º heat?). In a large Dutch oven over medium heat, add about 2 tbs olive oil. When hot, but not smoking, add the onion and celery. Sauté the veggies until they are nice and soft. Add the garlic and cauliflower and sauté for about 5 minutes to soften the cauliflower. Don’t let it take on too much color or your soup may end up a funny shade of light brown. Add the stock and bring up to a boil. Cover the pot and turn down the heat to simmer the soup until the cauliflower is soft. When everything is nice and soft, turn off the heat and blend the soup (let it cool slightly if using a conventional blender). I recommend running it through a double mesh strainer to give the end product a nice, smooth texture. Return the strained soup to the heat, and add salt and pepper to taste. 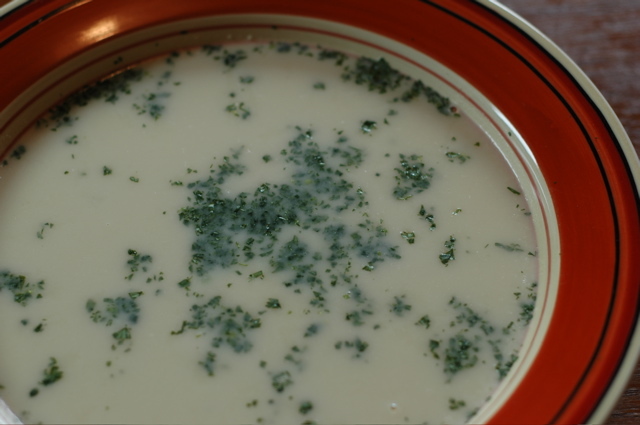 If the soup is too thin, add either the cream or some of the strained soup solids back in (up to ¼ cup). Serve warm, sprinkled with the chopped parsley.